Affinity purified against GST-KLHL3 (287 – 587) [DU 23175] and then depleted against GST. 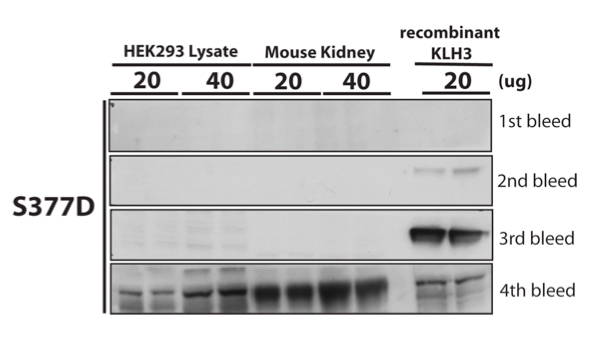 The fourth bleed of anti-KLHL3 (287 – 587) S377D can immunoblot endogenous KLH3 in HEK293 cells and mouse kidney extracts. Anti-KLHL3 (287 – 587) S377D can immunoprecipitate overexpressed FLAG-KLHL3. FLAG-KLHL3 (human) was overexpressed in HEK293 cells. KLHL3 was immunoprecipitated from 200 ug of total lysate using 5 ug of anti-KLHL3 (287 – 586) S377D. The immunoprecipitate and supernatant was then immunoblotted using anti- FLAG.